What Is DA Form 3439? DA Form 3439, Nonappropriated Fund Instrumentality Employment Inquiry is a form used for verifying prior employment by the Civilian Personnel Advisory Center (CPAC) Non-appropriated Fund (NAF) HR Division prior to all offers of NAF employment except for emergency flexible appointments. The latest release of the form - sometimes incorrectly referred to as the DD Form 3439 - was introduced by the Department of the Army (DA) in January 2002 with the previous edition being obsolete. An up-to-date DA Form 3439 fillable version is available for digital filing and download below or can be found through the Army Publishing Directorate website. A Nonappropriated Fund employee - or a NAF employee - is a federal employee with a salary paid from funds self-generated by Army-run clubs, sports centers, golf courses, and other activities that use NAF staff. The two types of NAF employment are "flexible" and "regular" jobs. Flexible employees may work from zero to forty hours per week and are not eligible to receive benefits. Regular employees work between twenty and forty hours per week and are entitled to some benefits. How To Fill Out Da Form 3439? 4. WOULD YOU REEMPLOY APPLICANT IN THE SAME POSITION? accomplishes duties in an approved manner within time established. b. COOPERATION - A team worker, maintains good working relationships. work without detailed instructions or supervision. judgment in meeting adverse or emergency situations. e. ADAPTABILITY - Ability to adjust to changes in working or living environments. toward different races, religions, and nationalities. applicable to the job for which being considered. MANAGERIAL SKILLS - Ability to plan and organize work. SUPERVISION - Ability to supervise other employees. 6. Do you have any reason to question this person's loyalty to the United States? honest, trustworthy, and of good conduct and character? furnish, to the best of your knowledge, information as indicated on the enclosed DA Form 3439.
for selection for the above position. above if he or she should so request. 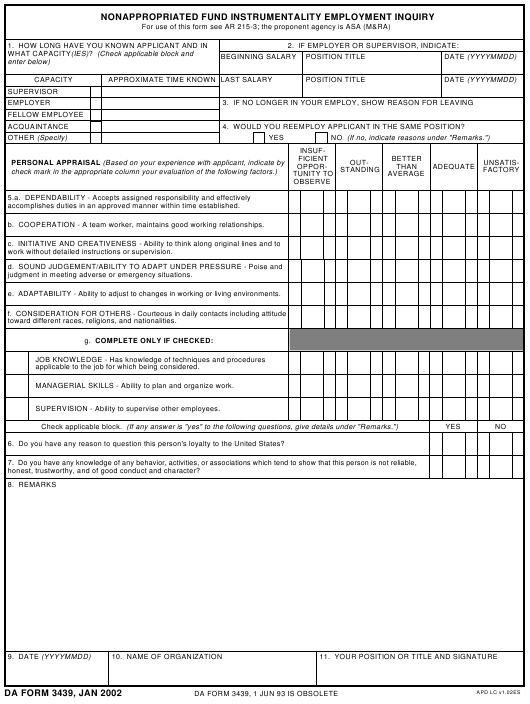 Any document or form originating during NAF employment - like requests for personnel actions, letters of reprimand, copies of the DD Form 1172-2 (Application for Identification Card/DEERS Enrollment) or internal placement forms - will be contained in a temporary electronic official personnel folder - or eOPF. The CPAC NAF HR Division will establish a suitability file for the information and documents acquired during the background check. This information will be used to determine whether or not a candidate or current NAF employee is suitable for employment. The CPAC NAF HRD Division will also establish security clearances files and retain those files for two years after the date of separation. No parts of the suitability file can be kept in an employee's eOPF.